Adornments: Crystals, filligree bead caps, red glass dew drop, and silver filigree finding accent. Pen shaft is wrapped in multi-hued black ribbon which has been specially sealed for longevity & durability. Finished both front & back. Pen shaft is wrapped in hand-dyed & hand-combed merino roving. Specialty Beads: A handcrafted black hematite Mystic Kitty totem bead. 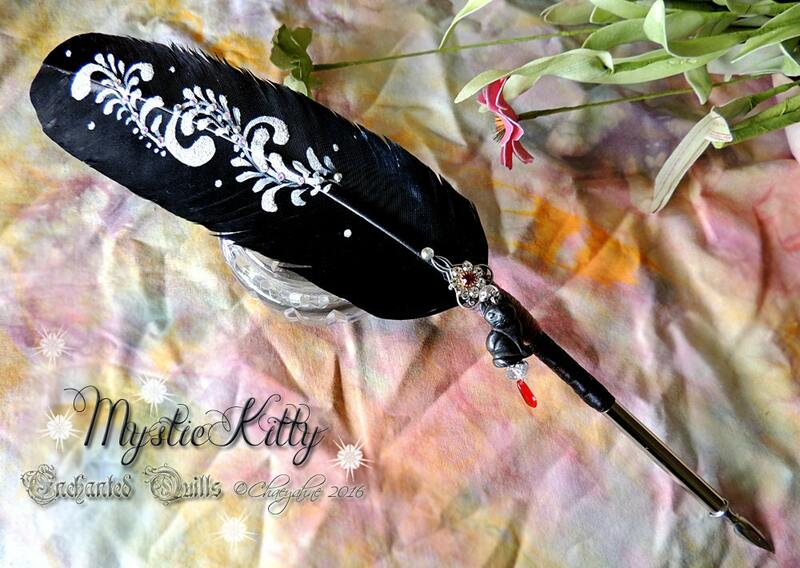 The pen shaft is wrapped in shimmery silken threads, and sealed for durability. These pens are also listed on the main website at www.chaeyahne.net, and are available while supplies last.